This work is by the author of The Magician's Companion, an immensely valuable encyclopedia of magical systems and symbols that should be in the esoteric library of every serious magician. 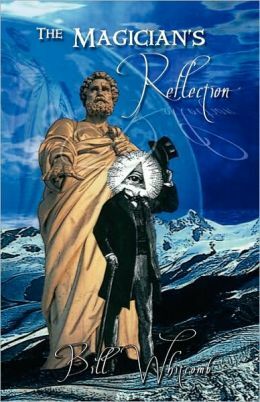 The Magician's Reflection is a companion-supplement book that is intended as a dictionary of symbolism and a workbook for those who would like to create a magical symbol system of their own. The book has three parts: 1. Magical Symbols and Exercises, 2. Putting It All Together, and 3. What To Do with a Magical Symbol System. With the rising popularity of Chaos magic, there's a growing need for a book offering guidance to those who want to experiment and create their own systems. Whitcomb outlines the various steps and procedures necessary to flesh out a personalized series of symbols. Once that system is created, there are instructions for constructing tools, rituals, and other magical procedures like talismanic constructions, pathworking, and the development of a magical name and identity. It's a bottom to top handbook with thirty-one chapters that cover everything an aspiring magician could think of and a lot that might not be thought of. Whitcomb is a capable writer and highly knowledgeable about what it takes to construct a viable set of personalized symbols. He offers advise on the different kinds of construction (amorphous, hierarchical, cyclical, etc) that the reader might choose for the armature of a personalized symbol set. These can be intertwined with correspondences to colors, sounds, animals, gems/minerals, herbs/plants, trees, spirits or deities, physical objects and philosophical concepts (love, will, thought, etc). A viable personalized system requires multiple layers of correspondences to anchor the original symbols and allow them to work on a conscious and subconscious level. Each chapter ends with exercises that guide the reader through the process of gaining insight into different aspects of a symbol system. Some of these are very clever, since they not only guide the individual in what to think about, but how to think about it. There's an astonishing level of detail in the book, and Whitcomb clearly knows his way around an altar and a plethora of existing magical systems. Building a personalized magical system and symbolic set clearly isn't a weekend romp – its a project requiring a great deal of clear and subtle thinking that occurs over time. Ultimately the creator should be able to use his or her original system in magical practice. Readers – be warned! The type font is TINY. There's a great deal of content, and the book is 386 pages long even with the miniscule print. There are Victorian-style illustrations scattered throughout the text (always a plus), as well as some graphs and examples of symbols where required. There are some oddball markings that might have been typographic symbols or notations but converted back to whatever wingding was in the primary font. So there are some formatting puzzles, but not prohibitive ones. Overall the formatting is pretty good, but some readers will need a magnifying glass or a good pair of cheaters to see the text. The end of the book has two appendices. Appendix A features the NAR Alphabet, and Appendix B the Alphabet of Dreams. There are examples of what a magician can do in the way of creating a personalized symbol set, and demonstrates how two capable individuals (Michael Skrtic and Bill Whitcomb) developed original systems that are usable on multiple levels and based on specific philosophical criteria. This is a unique and valuable text for anyone who wants to try this kind of project. I'd also recommend the book for anyone who is considering creating their own oracle deck, tarot deck, original divinatory method or board game, since the exercises and the organizational tips are highly valuable to those types of creative projects, too. There are plenty of books out there that describe and give instructions for ancient and traditional magical systems, symbols and alphabets, but this is the first one I've seen that shows someone how to build his/her own.